I‘m a huge believer in the power of habits for helping to put everyday decisions on autopilot, making it much easier to live a healthy life. One of the things I’ve learned in my study of habit formation over the years is the power of public commitment. Earlier in the year, I joined Febfast and committed to a month without alcohol. It was tough. Especially the night we were staying with friends in Sydney and everyone else was drinking really lovely wine. But you know what kept me from caving? The thought of having to sit down here and admit to you that I had broken my promise. While Febfast is long gone, I have a few bad cooking habits that I’ve been trying to kick on my own. And if truth be told, I haven’t been having much luck. So today I’m ‘outing’ myself on my 3 worst habits. I’ll report back in a month or so to let you know how I’ve gone. As I mentioned in my interview with the lovely Darya Rose a few weeks ago, picking at food while I cook has long been my worst cooking habit. Now that I’m getting dinner ready for Fergal before I start cooking for my Irishman and me, it’s been getting worse. I hate that feeling of sitting down to dinner and not being hungry. Darya had some brilliant advice around setting boundaries for snacking, like using a plate and only doing it sitting at the table. I’ve been working on implementing this for a few weeks now, and while I have made some progress, there have been times when I have had my official snack and still picked while cooking. I need a bit more help with this one. Even though we have top quality knives and the easiest sharpening system ever, I’m very embarrassed to admit that I can easily go weeks if not months without sharpening. I know dull knives are dangerous. I just can’t explain this terrible habit apart from being super lazy. So I commit to sharpening my knives at least once a week on Sunday or Monday. I’ve started this week off with sharp knives. It feels great. I think this habit started when we were buying most of our veg from the supermarket. Those pre-washed bags of salad leaves and herbs are just ‘oh so easy’. Now we buy the lions share of our veg from the farmers market. I’m loving the increase in quality and freshness but have honestly been ‘pretending’ to myself that the leaves don’t need washing. When clearly they do. I know. I can’t believe I’m going to put this in writing, but we had a guest staying who found a slug in the salad. Even that mortification hasn’t wrenched me out of my slothfulness. It’s definitely time for a change. So when I report back I’m planning on my salad spinner being my new best friend. Do you have any bad cooking habits that you’d like to break? Or even some good habits you’d like to form? OK so if you’re a purist when it comes to the naming of dishes, you’d better block your ears. I know that carbonara traditionally includes egg yolk and no cream, but I really liked the sound of kale ‘cabonara’ and I felt more in the mood for cream than egg yolk… so that what we have. 1. 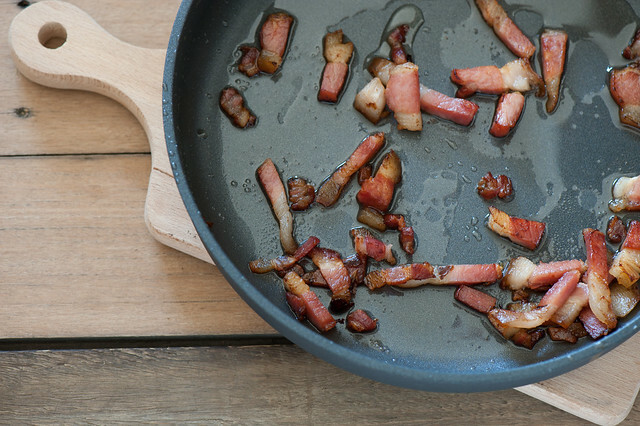 Heat a little olive oil in a frying pan and cook bacon on a medium high heat until well browned. 2. Remove bacon from the pan and add the kale and garlic. Cover and cook, stirring every few minutes until the kale is wilted and deep green in colour. It will take about 5-10 minutes. If it starts to burn, add a splash of water to help generate some steam. 3. Return bacon to the pan and add cream. Stir over the heat to warm through then remove from the heat and add the cheese. 4. Divide between two plates and serve with extra cheese if you like. more substantial / carb lovers – toss in some cooked pasta at the end. A drained can of chickpeas or white beans will do the same job without causing blood sugar problems. paleo / more classic cabonara – replace cream with 2 egg yolks. Add the yolks with the bacon off the heat. And see the dairy-free option. dairy-free – replace cream with 2 egg yolks and replace parmesan with grated brazil nuts and if you like a teaspoon of nutritional yeast. vegetarian – replace bacon with chopped smoked tofu – a really lovely ingredient. OR serve with a big handful of smoked almonds or other nuts. different greens – as much as I love kale, any leafy greens such as spinach, baby spinach, chard or silverbeet can be used. vegan – cook sliced kale with garlic in olive oil and serve with more olive oil and a good few handfuls of roasted nuts or cooked legumes. I’m terrible about washing salad! I don’t have a spinner so I know it’s going to be a hassle to rinse it and then shake it out in a colander. This sometimes even keeps me from bothering to make salad, which is terrible. I think my biggest sin is impatience. I put things in the oven before it’s fully preheated. I crowd veggies in the pan for stir fries because I don’t want to bother doing 2 batches. My marinades have hardly touched the food before I throw it in the pan. My soups simmer for 1/2 the time they’re supposed to. Get a salad spinner…and plan to get another in 2-3 years. (I can’t keep mine clean enough longer than that and a dirty spinner doesn’t seem right.) It makes rinsing and especially drying SO much easier! Having a small apple or any fruit before you start cooking won’t get you all tempted by the aromas and pick food. I had this habit and this really helps. When you are hungry you end up eating while the food’s getting ready and are not really hungry at the table. Yes on the leaves and herbs. I’m terrible about washing them. I have a salad spinner but it’s so big and bulky and plastic. I hate to wash it, I hate to dry it. And the plus side, we’re eating leaves and herbs! 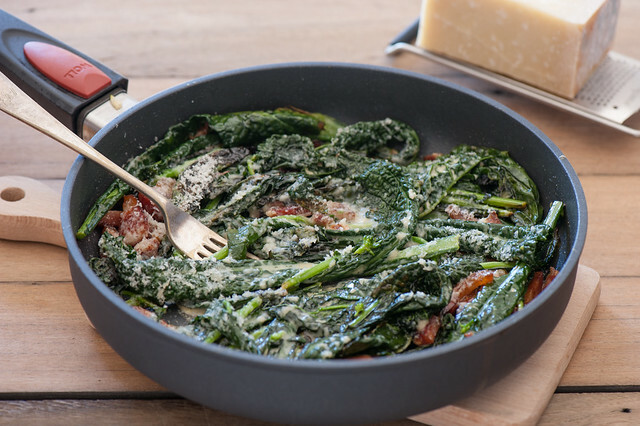 That kale looks delicious–love the idea of a creamy kale dish. As for me, I’m with you on the slack sharpening practices. Good idea on the weekly sharpening date, I might have to steal that idea! I was just planning a carbage carabonara this weekend. I love carabonara, but would like a low carb version. I never wash my iceberg lettuce, I just peel off the leaves and use them. Unless my potatoes are for mash, I never peel them, I can’t be bothered. In fact if I can get away from peeling any veg, I do. Do you know you can get parasites on the brain from ingesting slugs/slug slime particularly through unwashed salad veg? Knowing that motivates me to wash every time! I don’t really trust things are really washed properly in salad bags at supermarket either! I can’t be bothered with recipes that require creaming butter and sugar or using an electric mixer. If I can’t mix wth a spoon I can’t be bothered. And i’m impatient too, so muffins rather than cakes for me!!! No I didn’t know about brain parasites from unwashed salad. Eek! Another great reason to wash.
Hadn’t thought of it from B12 perspective birgit…. But with a baby in the house I really need to be more on top of the cleanliness thing! Wow really interesting. Thanks for the link Fiona! You’re so right Daisy, it doesn’t hurt to re-wash! I wanted to share one of my experiences that made me change a cooking bad habit. I have always been really good about washing greens and other vegetables but I rarely washed our fruit. Then, one day as I was walking through the produce section of the store I saw a person, I almost called her a lady but that doesn’t really fit here, smelling the apples. But she wasn’t just smelling. She was rubbing her nose all over the apple then she would shake her head, put the apple down and grab another apple and do it all over again. After seeing her do this and discard 4 apples I vowed to myself that I would ALWAYS wash my fruit from there on out. You never know who has been snorting on your apple before you bite into it. Lesson learned! Thankyou for this story. I’m usually good with washing fruit but you’ve given me some extra (very powerful) visual incentive! Oh the slug. Just shows the produce you served your guests was super fresh and not from a bag. Wear it as a badge of honour in public (okay and wash those leaves in future!). Too funny. I’m not very good at washing veg, salad leaves etc either and I think it’s because it’s after work, it’s 7pm and I’m hungry; my focus is just get the food cooked so I can eat! I went away with the friend and I think she has the answer! Wash it all at once(!) and then put it back in the fridge clean. So this is what I do now and I feel way less guilty when I cook. In fact, my produce is now staying way more fresh in the fridge, as after I wash it and pop it all in containers, lined with paper towel and have said goodbye to saggy wilted greens in the plastic bags! Sounds like you have a very wise friend Caitlin! Am going to try this myself… and will try the bacon too.